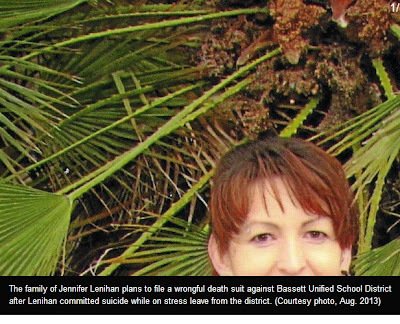 LA PUENTE >> The stepfather of a Bassett High School art teacher who committed suicide in July has announced plans to file a wrongful death suit against the district after claiming his stepdaughter’s death resulted from bullying by administrators. A series of incidents led to Jennifer Lenihan taking a stress leave, which left her in such financial turmoil that she took her own life July 1, the day her mother went to give her money to help with rent, according to Manuel Jaramillo, her stepfather. In the documents she left behind, Lenihan spoke of being harassed in front of students and other staff members, Jaramillo said. He declined to give names because it could hurt his future case. A fellow employee who spoke anonymously out of fear of retaliation said she recalled two administrators, Robert Reyes and Jimmy Lima, the principal and assistant principal respectively, yelling at Lenihan in a courtyard in front of teachers and students. A friend of Lenihan said she told him of also being talked down to in her classroom while students watched. Reyes and Lima did not return calls for comment. A second ordeal involved a yearbook class the high school’s administration took away from another teacher and gave to Lenihan, despite her saying she did not feel comfortable teaching it. The class, typically a senior level class, had too many freshmen and did not receive enough funding. It also did not have lenses for the cameras used in the class, according to the teacher. When asked not to have the class, she was told she had to take it or she would lose another class she taught, Jaramillo said. “The pressure got too great, and she left the school,” Jaramillo said. She received half her monthly salary while on a stress leave, which lasted from October to July, during which time she was denied disability and workers’ compensation. She took out a personal loan just to get by, Jaramillo said. She did not receive any part of her salary the month she killed herself because of the denial of workers’ compensation, Jaramillo said. She was instead told she could resign or apply for a waiting list to return to the district, he said. The type of belittlement Lenihan allegedly experienced has become standard in the district, according to teacher Tom Covington, who spoke separately from his position as the teachers union’s vice president. “It is part of what they do, they make you so unhappy, they want you to leave,” Covington said. Bassett Teachers Association President Maryellen Daners has received a number of complaints about Reyes and Lima, and in general, says morale has dropped dramatically across the district in recent years. “People see what is happening, and they’re afraid it could happen to them,” she said. Changes, such as eliminated positions, seem related to personal issues rather than performance ones, she said. Lenihan was meeting with the California Teachers Association to get assistance with her problems in the district, but Daners could not speak to specifics. Bassett Unified’s new Superintendent Jose Reynoso said he is not aware of Lenihan formally bringing up the problem to the district’s top administrators. Reynoso said he had no idea of the family’s accusations until the family announced their plans for a lawsuit at a recent board meeting. No one came forward to speak about the notes and the topic dropped, he said. The district does not have a morale problem, he said. Teachers who have spoke to him seem positive about the new year, he said. “I see a new spirit in them, and it really brings me joy,” he said. Reynoso said he feels sad about the passing of Lenihan and the pain her family is feeling but that he feels the district did everything it should have. Desmond Jervis and Hugo Lopez both had Lenihan their senior year in 2005 and continued to stay in touch with her after graduation. Jervis described Lenihan as someone who, despite barely making enough to live on, would buy paint and supplies for her classes out of her own pocket. Jervis noticed the change in recent months. Lenihan stopped wanting to be around her friends and even turned down visits to art museums, which she previously loved. “They took away her happiness,” he said. Lopez spoke before the Bassett Unified board at its last meeting and called for a change. Reach the author at jason.henry@sgvn.com or follow Jason on Twitter: @JasonMHenry. Inside the teacher trials known as 3020-a, the basis for proceeding, says the UFT, NYSUT and the Department of Education, is Education Law 2590-h(19) and (38), and Section 2590-J(7). However, arbitrators are appointed under Section 3020-a, and proceed with hearings pursuant to Education Law Section 3020-a. In the packet all charged DOE employees get who ask for NYSUT assistence, General Counsel Richard Casagrande or one of his Attorneys write that the charged member has "No Right" to proceed according to 3020-a, only by the procedures in the MOA, or letter dated April 15, 2010 and in Article 21G. (p. 113). Herein lies the problem. "19. Delegate any of his or her powers and duties to such subordinate officers or employees as he or she deems appropriate and to modify or rescind any power and duty so delegated." "38. To exercise all of the duties and responsibilities of the employing board as set forth in section three thousand twenty-a of this chapter with respect to any member of the teaching or supervisory staff of schools under the jurisdiction of the community district education councils. The chancellor shall exercise all such duties and responsibilities for all community districts or may delegate the exercise of all such duties and responsibilities to all of the community superintendents of the city district. 38-a. To exercise all of the duties and responsibilities of the employing board as set forth in section three thousand twenty-a of this chapter with respect to any member of the teaching or supervisory staff of schools which are not covered under subdivision thirty-eight of this section. Provided, however that the city board shall maintain jurisdiction over any consequence resulting from an employee waiver of a hearing, as provided for in paragraph (d) of subdivision two of section three thousand twenty-a of this chapter." " 7. (a) No member of the teaching or supervisory staff of schools who has served the full and appropriate probationary period prescribed by, or in accordance with law, shall be found guilty of any charges except after a hearing as provided by section three thousand twenty-a of this chapter. (b) Charges may be initiated by the community superintendent against any such employee for any of the following offenses: (1) Unauthorized absence from duty or excessive lateness; (2) Neglect of duty; (3) Conduct unbecoming his position, or conduct prejudicial to the good order, efficiency or discipline of the service; (4) Incompetent or inefficient service; (5) A violation of the by-laws, rules or regulations of the city board, chancellor, or the community board; or (6) Any substantial cause that renders the employee unfit to perform his obligations properly to the service. (c) The community superintendent, in advance of the filing of charges and specifications, shall inform the employee accused and the community board of the nature of the complaint. No charge shall be brought outside the statute of limitation period provided for in section three thousand twenty-a of this chapter. (d) Upon the service of a copy of the charges upon such employee, the community superintendent may recommend to the chancellor the suspension of any such employee. If the chancellor shall determine that the nature of the charge requires the immediate removal of the employee from his assigned duties, he may suspend such employee for a period not exceeding ninety days pending hearing and determination of charges, provided however, that such employee shall be entitled to receive full compensation during the period of suspension. In case the employee is acquitted, he shall be restored to his position." It used to bother me when I sat in on 3020-a arbitration hearings as an observer, 2003-2011 and the NYSUT Attorney (very few UFT members hired private attorneys, and rarely had open and public hearings) would push aside any mention of how Joel Klein, the "Chancellor" could delegate to any Superintendent the power and authority he supposedly had, to discharge charge, etc., any member of the teaching or supervisory staff and, essentially be the 'employing board' to do all these things while 'under the jurisdiction of the Community district education councils'. This makes no sense. The CECs are face-time panels, just like the Panel For Educational Policy, for people who want 15 minutes of fame and desperately need to feel important. It's a claim to fame seat that never does that, due to the fact that we, the knowledgeable public, know that the CECs and PEP are only for show. All members are powerless, and they have no administrative, policy-making, or executive function. So, 'under the jurisdiction of the CECs' means to me that the DOE is creating another "wrong way street" in the law and procedure of 3020-a so that people go down the wrong path when they try to pursue their rights. I'm not going there, but you can if you want to. I have not met a DOE 'official' who does not need to be questioned about this no exit/dead-end. And where does it say that principals may find and declare probable cause and then file 3020-a charges and testify about misconduct at a hearing started by the him/her? I dont see it. "The office of chancellor of the city district is hereby continued. Such chancellor shall serve at the pleasure of and be employed by the mayor of the city of New York by contract. The length of such contract shall not exceed by more than two years the term of office of the mayor authorizing such contract. The chancellor shall receive a salary to be fixed by the mayor within the budgetary allocation therefor. He or she shall exercise all his or her powers and duties in a manner not inconsistent with the city-wide educational policies of the city board. The chancellor shall have the following powers and duties as the superintendent of schools and chief executive officer for the city district, which the chancellor shall exercise to promote an equal educational opportunity for all students in the schools of the city district, promote fiscal and educational equity, increase student achievement and school performance and encourage local school-based innovation, including the power and duty to..."
then you see that in order to have the powers that he can, by law, delegate to Superintendents under the jurisdiction of the CECs, the chancellor must have a contract. Most people know that Joel Klein did not have a contract, according to Susan Holtzman. She never changed her tune, even after sending me the letter from Mike Bloomberg welcoming him to his job as Chancellor, which some people say is a "contract". At least he, Joel, and Mike signed and dated the document. A voluntary, deliberate, and legally binding agreement between two or more competent parties. Contracts are usually written but may be spoken or implied, and generally have to do with employment, sale or lease, or tenancy. A contractual relationship is evidenced by (1) an offer, (2) acceptance of the offer, and a (3) valid (legal and valuable) consideration. Each party to a contract acquires rights and duties relative to the rights and duties of the other parties. However, while all parties may expect a fair benefit from the contract (otherwise courts may set it aside as inequitable) it does not follow that each party will benefit to an equal extent. Existence of contractual-relationship does not necessarily mean the contract is enforceable, or that it is not void (see void contract) or voidable (see voidable Contract). Contracts are normally enforceable whether or not in a written form, although a written contract protects all parties to it. Some contracts, (such as for sale of real property, installment plans, or insurance policies) must be in writing to be legally binding and enforceable. Other contracts (see implied in fact contract and implied in law contract) are assumed in, and enforced by, law whether or not the involved parties desired to enter into a contract. Below is the definition of "Voidable Contract"
A contract that has legal effect and force when it is made, but is liable to be subsequently annulled or set aside by the courts through the process of rescission. Circumstances or features that make a contract voidable include (1) non-disclosure of one or more material facts, (2) misrepresentation, (3) mutual mistake, (4) lack of free will of a contracting party, or presence of one contracting party's undue influence over the other, and (5) a material breach of the terms of the contract. A contract that is voidable in only one or few parts may be saved by the process of severance. Not to be confused with void contract. I argue that there is something not right about the "contract" signed by Dennis Walcott. He did not date his signature on this document, which may be a "contact" in the very general description of what a contract is, but to me, Dennis still does not have the power to delegate the authority to charge and discharge DOE staff. No date? How is that, Dennis? "1. Filing of charges. All charges against a person enjoying the benefits of tenure as provided in subdivision three of section one thousand one hundred two, and sections two thousand five hundred nine, two thousand five hundred seventy-three, twenty-five hundred ninety-j, three thousand twelve and three thousand fourteen of this chapter shall be in writing and filed with the clerk or secretary of the school district or employing board during the period between the actual opening and closing of the school year for which the employed is normally required to serve. Except as provided in subdivision eight of section two thousand five hundred seventy-three and subdivision seven of section twenty-five hundred ninety-j of this chapter, no charges under this section shall be brought more than three years after the occurrence of the alleged incompetency or misconduct, except when the charge is of misconduct constituting a crime when committed. 2. (a) Disposition of charges. Upon receipt of the charges, the clerk or secretary of the school district or employing board shall immediately notify said board thereof. Within five days after receipt of charges, the employing board, in executive session, shall determine, by a vote of a majority of all the members of such board, whether probable cause exists to bring a disciplinary proceeding against an employee pursuant to this section. If such determination is affirmative, a written statement specifying the charges in detail, the maximum penalty which will be imposed by the board if the employee does not request a hearing or that will be sought by the board if the employee is found guilty of the charges after a hearing and outlining the employee's rights under this section, shall be immediately forwarded to the accused employee by certified or registered mail, return receipt requested or by personal delivery to the employee." Aha!! Ed Law 3020-a(2)(a) mandates an Executive Session of the employing board and this board shall vote on probable cause. This is, it seems to me, a conflict with 3020-a. On the one hand, 2590-h says that Dennis Walcott has all the powers of the employing board, which is the PEP, I guess (I dont believe this, and never have - we need to have a School Board that is NOT appointed but ELECTED by all the voters who are held accountable for their individual and collective actions), so, even if we accept the idea that the letter which has no date under Dennis Walcott's 'signature' is "valid" (see above in my article about the Second Who Are You Kidding Award) doesn't Dennis Walcott have to go into an Executive Session and have a vote on probable cause before a teacher is given the specifications, pursuant to Ed Law 3020-a(2)(a)? NYSUT says Im a criminal for asking this question, but my clients are not being terminated at 3020-a, and I think that this is because my Motion To Dismiss asks the arbitrator to not proceed until the conflict of law is settled by either a court or the State legislature. To all: when you are served your packet of papers telling you that you are charged with 3020-a, READ the entire package! There is gobblygook in it.